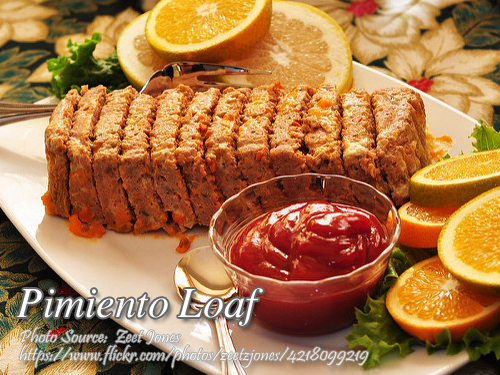 This recipe is actually a meat loaf with red and green bell peppers as the star ingredient that is why it is called “Pimiento Loaf”. Pimiento is the Spanish word for bell peppers. Anyway if you are unfamiliar with steam baking; it is baking the meat loaf by placing the meat loaf tray to another tray with water. This method of baking will make the meat loaf moist. To cook pimiento loaf; Mix all ingredients. Brush bread pan with oil and pack in mixed ingredients. Cover with foil and steam-bake for 1 hour. You may also wrap mixture in caul fat and roll it up like an ’embotido’. Cool before slicing. Serve with catsup. Mix all ingredients. Brush bread pan with oil and pack in mixed ingredients. Cover with foil and steam-bake for 1 hour. You may also wrap mixture in caul fat and roll it up like an 'embotido'. Cool before slicing. Serve with catsup.